The brutal murder of Lavalé fey Avecath, the King's First Magistrate and advisor, interrupts Constable Inspector Reva Lunaria's day off. The victim's status makes this a high-profile investigation, bringing with it unwanted attention from Senior Inquisitor Ailan Malvaceä of the Sucra, the King's secret police. The manner of the victim's death makes this case even more intriguing. A body cut perfectly in half - from top to bottom - is a rare occurrence, even in a city filled with all manner of magic weapons. All of this would be challenging enough, but Inspector Lunaria must also deal with a new partner, Seeker Ansee Carya, who is clearly not up to her standards. As Reva faces a growing body count, Senior Inquisitor Malvaceä undertakes his own mission to find the same killer, but with a very different agenda. Reva's investigation takes unexpected turns as wild conspiracies, hidden addictions, and Dark Elf soldiers all threaten to distract Reva from tracking down the killer. Reva's only hope of stopping the serial killer from cutting more prominent citizens of Tenyl in half is to figure out how to work with Seeker Carya and overcome her own weaknesses. 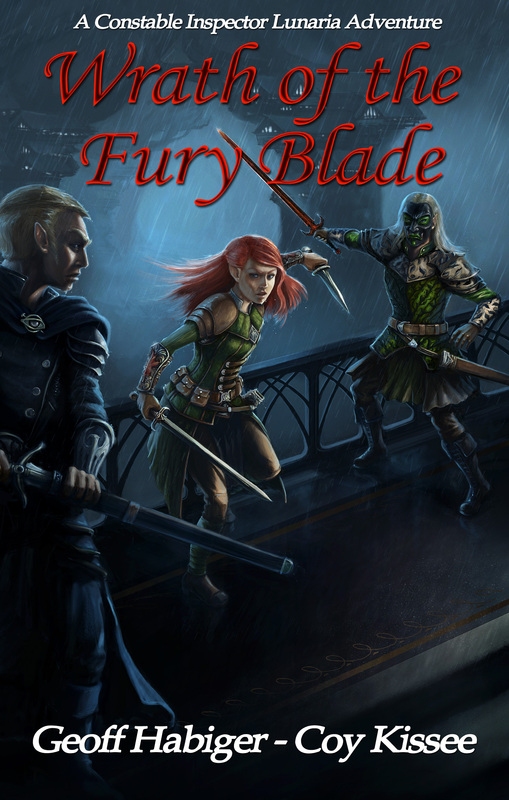 Wrath of the Fury Blade is available as a downloadable e-book from Amazon Kindle for only $2.99. Kirkus Reviews In this marriage of fantasy and procedural thriller, the team of Habiger and Kissee (Unremarkable, 2018) gives fans of both genres a master class in worldbuilding. US Review of Books Wrath of the Fury Blade is a masterful marriage of genres and a must-read for fantasy and thriller lovers alike. Readers' Favorite Wrath of the Fury Blade is an engaging crime fantasy read interspersed with conspiracies, a secret order, and suspenseful moments.